16 days ago I sat and watched the Olympic opening ceremony from a field in front of a big screen at the Adidas Thunder Run before a wonderful weekend. Such a fantastic atmosphere that has continued. Tonight I have watched the closing ceremony and wondered where have the last 2 weeks gone? Team GB have won 65 medals, I’ve run 60 miles and just about held the fort domestically, but done little else! Why? I’ve been glued to the TV! Have been watching and enjoying sports I’ve never watched before and have been standing up shouting at the TV! Well done London 2012 and team GB! 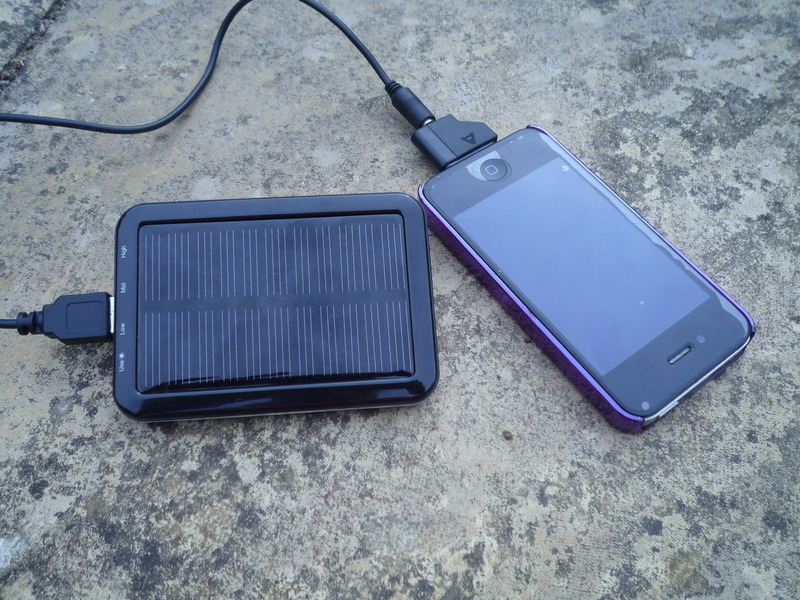 What I should have done is finish my review of Mobile Solar Chargers which kept me charged up at TR24 and tweeting through the opening ceremony! These are basically portable back up batteries which can be charged from USB, the mains or by the sun which will then re-charge iPhones, iPods, smart phones, using micro USB, Nokia phones plus anything charged by USB, ie rather usefully my Garmin! I was sent two models, which arrived rather appropriately the morning I left for TR24…. I pre charged both as much as I could before I left home. The slightly larger unit with LED light (about the same size as an iPhone) charged everything from iPhones to my Garmin that we tried it on, keeping my iPhone going during the opening ceremony and then recharged very well from a sunny spot in our campsite and my car dash-board the next morning to go on and boost my Garmin’s battery for my night run and keep my iPhone going. The smaller unit I was less impressed with at the time, only charging my teammates Samsung smart phone. 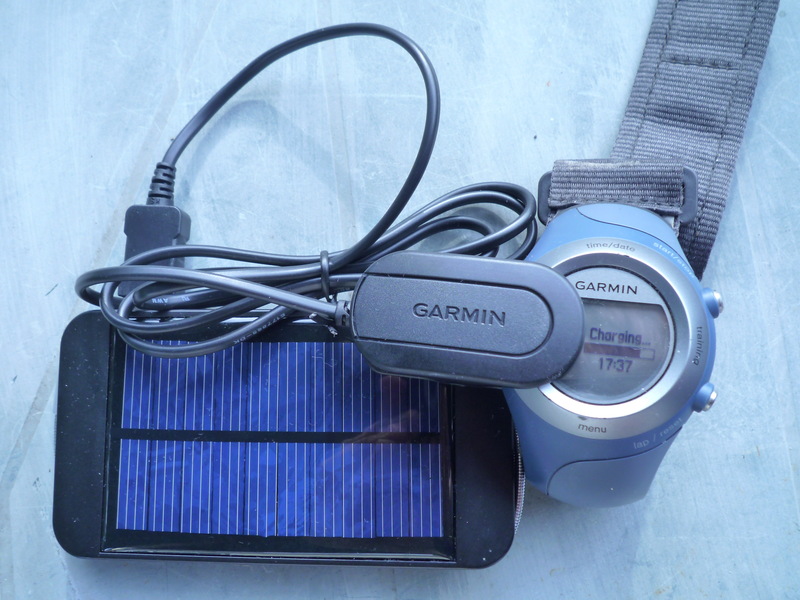 However since then I have fully charged it from the mains or my pc a few times and it now charges both my Garmin via USB and iPhone perfectly, obviously needing its full battery charge, which can only be achieved after a few full charge-discharge cycles to work on these. I think I preferred the slightly larger model, maybe because I had success with it from the start, but also because of the clear % charge indicators on the reverse plus the very useful LED light which was useful to make sure I’d switched everything on and set the right alarms in a dark tent! These back up batteries work, are versatile, being able to recharge them by several means and are perfect for travelling, camping, multi day ultra running, hiking or festivals for keeping your smartphone (and garmin if you’ve got an old one with rubbish battery life) charged while away from civilization. They are definitely worth checking out and if your phone requires a different connection (if only phone companies would standardise connections) Mobile Phone Chargers are open to feedback/requests. Mine is now a bit of essential kit to pack for races, events (TR24 next year!) as a backup for my iPhone, iPod and Garmin and I have even had to promise to lend mine to my brother for the End of the Road Festival! Categories: Product review, running | Tags: Adidas Thunder Run, Garmin, iPhone, London2012, Mobile Solar Chargers, smart phones, Solar chargers, teamGB | Permalink.